When the members Cross Canadian Ragweed decided to shift gears and word soon leaked out about Cody Canada’s new project, The Departed, that would feature Jeremy Plato and some of the most accomplished musicians to be found anywhere the buzz was immediate. Fans wondered what would this band sound like, what would their first studio project be and how long before we could put our hands on it? Owning up to a promise Canada made at the height of Ragweed’s rise to do a covers album of the Oklahoma/Red Dirt music that influenced him so much, and in his words “changed his life”, The Departed set out to tackle 16 blistering tracks of powerful Red Dirt history. Songs like “Water Your Own Yard” and “Face On Mars” (written by Randy Crouch) had really only lived in the land of yesteryear nostalgic lore until given new life by The Departed. “The Ballad of Rosalie” is a rollicking tale of a fast-lane music career as seen through the personified eyes of a pawn shop guitar. Hints of steel guitar mingle with a driving rhythm guitar to make the listener truly feel the heightened emotions the protagonist is feeling in the lyrics. “True Love Never Dies” is bolstered by a swampy, 70’s Jerry Reed-esque guitar and some of Littleton’s most inventive keywork and ends up sounding like a Little Feat B-side just now being released…which is what I think they were going for. “Long Way To Nowhere” greets you like a familiar Joe Walsh era-Eagles song you’d forgotten about with tight harmonies, lyrics about wanderlust and killer riffs throughout. “Staring Down the Sun” works on many levels and it takes several spins for the lyrics to sink in…and even then you may not be truly sure what’s going on. The entire tune from start to finish sounds like a John Ford western set to music. “A Little Rain Will Do” is one of the most timely songs ever released in Red Dirt music. Although it is set in the Great Depression, the problems detailed in the song sound an awful lot like what’s going on in the country today, and it packs a powerful punch. The set closes with an homage to the recently passed Oklahoma country music stalwart Mel McDaniel with a cover of his 80’s hit “Stand Up” that has been a live staple for several years now. Speaking of the aforementioned Little Feat and the Eagles, the general sound of this album is evocative of the best of 70’s rock…and that’s a good thing. This project harkens back to the golden ages of music in all ways. It’s a passion project plied with top-flight musicians who take turns on lead vocals, grand songwriting and warm vibes…three ingredients often not put together enough in modern music. Luckily for the listener, Canada and company have found this golden combination on This Is Indian Land. Seth James on guitar, Littleton keys, (incidentally the songwriter of “Any Other Way”), and Dave Bowen on drums joined Canada and Plato to deliver a greater sonic experience than what Ragweed had been. Bigger production and sound is found on this record without losing any of Canada’s signature intensity and grit which is a testament to the players and Canada himself for successfully chasing a daunting muse. 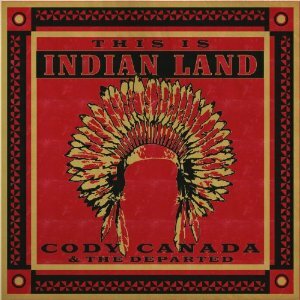 This Is Indian Land is a triumph on many levels and easily establishes The Departed as a formidable measuring stick that all Red Dirt and Texas bands must measure up to going forward. I was able to see 2 live shows already, actually the 6th and 7th, and even in those early shows, the passion and intensity they displayed playing was unbelievable. No doubt, more great music to come from an outstanding group of guys. Ed. Note—Thanks Sam. We knew that and just had it backwards. Fixed now! I have the pleasure of being able to blame the editor for all the mistakes in my writing… you’re stuck with both jobs, huh? Yep Crispy…had it right in my first draft and it got switched somewhere along the way. Tank’s in Italy and it fell at my feet all the way around. Great review and great album!! But, steve Littleton didn’t write Face on Mars. That tune was written by red dirt legend Randy Crouch. Ed. Note–We’ve already fixed that. Thanks for digging the review! I had a quick listen through while doing some stuff on the computer and I like the sound on a lot of songs. A few of the melodies weren’t my style but the music is solid throughout. Goods songs, no rapping, no screaming, no machine gun double kick drum.. It’s a solid album. I really want to hear originals from them. It’s hard for me to get excited about an album of covers, no matter how good it is. But that’s just me. I’d say that everyone should give this a listen through at least once. I just hope they record an album of originals within a year from now. This album has piqued my curiosity. I got it in the mail yesterday and autographed by the entire band. Favs so far are “Face on Mars”, “True Love Never Dies”, “Rosalie”, and “Long Way to Nowhere” is perhaps my favorite overall. I really dig 70’s rock n roll and I am a huge fan of Skynyrd, Allman Brothers, Marshall Tucker, Molly Hatchet, and J.J. Cale. I really think this album feels like it came right out of the 70’s. It has a classic rock sound to it, and I would describe it has a Skynyrd meets the Eagles sound, with a little Neil Young folk influence. This CD is amazing. I have been a Ragweed fan for years. However, these guys take it to a new level. A much more mature sound. You will love This Is Indian Land. I have seen Ragweed, live, countless times. Since the new band hit the road, I have seen them twice. I am in Memphis, so the do not get around here often. If you get a chance to see them live, make sure you do it. A talented group of guys who will not disappoint! Stand Up has been a live staple for years? By who? VTS agrees with the last half of Seth Graham’s Jones post. Ragweed use to do it years ago. I was thinking the same thing Vinny. I can’t ever remember Ragweed doing Stand Up. Thought maybe I missed it some where along the lines. I really like the album. I’m not in love with it yet though I’ll have to listen more. I hope an original album isn’t a long way out though. I’m really anxious to hear that. Holy smokes! This album is rockin! I am sad though for I will have to wait a while for a new one. All things in life change. Not sure if they hit a home run here. and make it important. More people need to look at this and understand this side of your story. I just want to say I am just newbie to weblog and certainly loved your web-site. Almost certainly I’m going to bookmark your blog post . You absolutely have fabulous posts. Many thanks for revealing your web-site. Thank you a lot for sharing this with all people you actually understand what you are talking approximately! Bookmarked. Please additionally consult with my site =). We can have a link exchange contract among us! hello!,I love your writing very so much! proportion we communicate extra approximately your post on AOL? I need a specialist in this space to unravel my problem. May be that is you! Looking ahead to peer you. You can certainly see your expertise in the work you write. The world hopes for more passionate writers such as you who aren’t afraid to mention how they believe. At all times follow your heart. Previous PostWhy you should have a "The Departed - Boarding Pass"